I am truly grateful to have had the chance to spend a term (fall 2010) in Boulder, and to get a close look at CSTPR and its different fields of work. Due to the fact that climate change communication in the media from the recipient’s perspective just has started to arouse interest among German scholars, I decided to profit from the further developed experience in this field abroad. At CSTPR I met Maxwell Boykoff, who strongly helped me to deepen my knowledge of environmental and climate change communication in the media, and helped me to get any possible opportunity to improve my professional work, and intensify my methodological skills. I experienced CSTPR and its team as a wonderful and stimulating environment for me as a visitor from abroad. During my time in Colorado I met many interesting people who helped me in bringing forward my ideas and notions concerning my work. I experienced Boulder as a wonderful and inspiring place for both work and living! 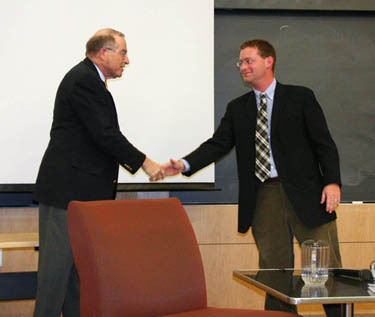 2005 Presidential Science Advisor Series. Thank you again for your support and a wonderful time in beautiful Boulder! All the best to you, and hopefully see you soon! Gesa Lüdecke, Visiting researcher, CSTPR August-December 2010, Ph.D. at Leuphana University of Lueneburg, Germany. Currently employed as research assistant at Leuphana.